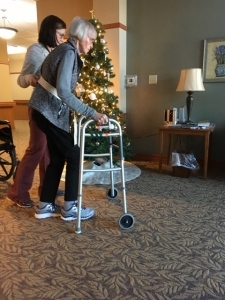 In six weeks, my mother moved three times, received physical therapy four times/day, and returned to using a walker just two weeks after fracturing her pelvis. This is heroic stuff for anyone. Mom is 92 years old. It is heroic because in your tenth decade, it is not just one thing not working like you expect. There is arthritis, misbehaving bowels, wavering balance, misfiring memory or mental synapses, and a general slowness to movement, to name a few. When a “new” event, often a fall, triggers a “big” malady, the accumulated stress on the body is often completely overwhelming and debilitating. Mom was overwhelmed and discouraged after her fall, but her usual kind nature drew health care workers to her. Her resolve to do her best during rigorous physical therapy sessions surprised everyone. Mom has not been an exerciser, but she wanted to get back on her walker. She did occasionally joke about hiding from her young, eager, skilled physical therapists. But they always found her! She still needs a watchful eye when walking or self-transferring, so she has been placed in a new section of her health care facility. And once again she is working to make friends, to participate in activities, and to be kind to her healthcare workers. As a life-long piano player, she has brought new life into the wing of her facility. 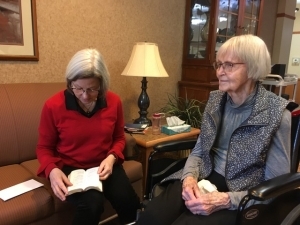 She wheels her wheelchair over to her piano in the family gathering area, carefully gets up on the piano bench and begins playing dozens of songs she has committed to memory. People begin wheeling themselves out of their rooms to hear her play. I am incredibly proud of my mother and I realize her story is being played out every single day in homes and facilities around the world. Who do you know that is determinedly putting one foot in front of the other— overcoming sometimes great physical, emotional, and financial odds. A neighbor? A relative? A friend of a relative? Find a way to spend time with them. Their time is not long on this earth. Their conversation might be slow, but their ability to get us to slow down and really listen is a gift. Their insights can be fresh and thought provoking if we let them. Mom and I talk about the veil between the worlds, about God’s plan for her, about conversing with Dad who passed away 5 years ago. I am not afraid of these conversations and listen carefully for openings that might encourage her to articulate some of her current inner journey. 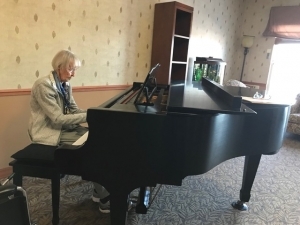 But I certainly notice how much happier she is now in her new setting thinking about playing the piano or participating in the next activity for residents. It clearly is a lot more fun to be engaged “here” and I am happy she still has that life force. “Really, you think I am courageous?” she asked when I wondered if she would be OK with me writing a blog about her. I am lucky. Mom can still converse, play the piano, read books, write in her journal and play cards. I intend to see her as often as possible in whatever months or years she has left. Like mother, like courageous daughter who kayaker around Lake Superior in the worst weather on record. Thank you for your tender tribute, Ann. Thank you for your kind comments, dear Marti, and for your fine, ongoing work in the world! Ah, Ann. So true. My mom complained, she was frustrated, she was not always kind, she sometimes drove me mad. But always, I recognized her incredible courage. She just kept getting up every morning, and getting dressed for the day. May Sarton wrote in one of her last journals: “Hope dies last.” In her book “As We Are Now,” she wrote:” I have seen in you what courage can be when there is no hope.” Yep. I don’t think there is any braver thing. Bless you, Gretchen. You have had so much experience in the Momma realm! Appreciate your wise words. Ann, thank you for sharing the love of your Mother. Reminds me of other courageous ‘Mothers’ who have been part of my life. I salute them all, living and passed into the next life. So true that we need to spend time with them, seek their story and soak in their wisdom through love. I am also glad you got to meet her. As you can see from the photos, she really does not look so different now. What a loving piece this is, Ann. May your mother, indeed, enjoy and live fully the time she has left in this life. What a joy to read your reflection. Ann, what a beautiful reflection of your mother and her courageous steps forward (literally and figuratively). I love your prompt to seek out those around us who are working hard to transcend challenges they would rather not have. How much we need each other! It’s also a way for us to “create village” where there may not appear to be one – a mutual blessing for us, too. Thanks for sharing this touching piece of life. Oh Ann, How lovely this is! My mom was also determined to be involved *here* up until her last moments. She had multiple medical issues that slowed her down but never stopped her from caring about all of her family and friends. Such wonderful examples for us. Indeed they are. I feel as if I am approaching my own elder years with newfound wisdom and humility. What an inspiring portrait of your mother’s resilience, grace and perseverance. I, too, immediately thought of your challenging kayak adventure. Beautiful writing and story, Ann. You can really feel the respect, you have for your Mom and for her process, coming off the page. Your Mom is very lucky to have you to take the time and to keep an open space by which to talk about all of those important items at her stage in life. AND, again, I am impressed with your Mom’s giving gifts to those living there – very special that she can play piano still and that it is available to her. I bet she feels no age when she is lost in her playing! Blessings to your dear Mother and blessings to you too. Your gifts are helping her gracefully, purposefully, and hopefully peacefully walk this part of her journey. This is a big thing to watch on your part. Yes, Jeanne, I think that when she is playing the piano she truly gets lost in her music and escapes the other confines of aging. This is so very touching and very wise. Brava to your mother, to you. Blessings to your mum and blessings to you, dear Ann. Thank you. Big love to you and your mom, Ann. Thanks so much for sharing her story. Dearest Ann, your description of the aging process is magnificent! And the tribute to your mom is glorious! Bless you. Thank you Ann for sharing the courage of your mother. It brought to mid my grandmother, who at 100 years, still rose daily and went to the window to give thanks for ‘one more day’. I visited her, as often as I could, for she was such an important teacher for me, I would marvel at her courage and willingness. Thanks for reminding me to go to my own window. Love to you, daughter of the courageous one. A beautiful tribute to your grandmother, Judy. Helps me better understand why you can do your work in the world on behalf of the earth. Well Annie, you’ve done it again! Found words for that which isn’t often voiced, because how does one convey the courage and dignity of one (I’m thinking of my mother) who got to the point where she couldn’t button her blouse, needed to be diapered, became totally dependent on caretakers, and yet never complained and didn’t lay her suffering on anyone else. Her last words to me were when I basically carried her to the bathroom (since she could hardly stand) and I said “you’ve really had it, haven’t you?” And she said “long time ago…” That was the only acknowledgment I ever heard her make of what it had been like to be so limited and so totally dependent on the kindness of others. As they say, old age ain’t for sissies! Thank you for your honesty, Julie! Such a beautiful tribute to a beautiful soul. What a gift your Mom is to so many. You are welcome. Happy to share my mother with the world. I am so moved by all you’ve expressed, and am teary as I think of my Mom, Anita, who transitioned in October. 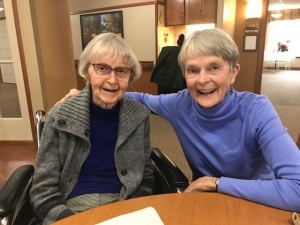 Her love of life in every way, her desire to live to be 100, and her kindness, courage and grace in the midst of losing her independence in her short journey with cancer at age 86 will inspire me every day of my life. To partner with her, especially on the last leg of her journey, was one of the greatest gifts of my life. I honor your mother, the gift she is to you and the world, and the savoring of your time together. Dear Friend, Thank you for this heartfelt story. Beautiful writing, Terry “It’s a journey that has no map, we find our way with the compass of the heart.” Thank you. I love all of this. Thanks for writing and sharing. Your are most welcome, dear Heather. This is absolutely beautiful! Her spirit and presence is one of a kind. I am so thankful I have her as a role model in my life. I think of her all the time and wish I had more time to spend with her in this crazy life. She amazes me everyday and her humble strength and her intelligence both emotional and worldly. Thank you for writing this made me tear up! When you love the daughter so much, it is beautiful to see the courage, kindness and hospitality in her mother. I love that music still flows through your mother’s fingers and brings joy to all around her. Your post reminds us of how we can all be with our elders. Thank you, dear one. Your own life shines like a beacon for all of us. I loved this. And it feels so good to go to bed with a grin on my face after seeing those of yours and your sweet mom. This is such a beautiful reflection Ann. Blessings and bravo to your mom, and to you my friend. Aging parents need so much love and patience. It’s an act of courage on everyone’s part to stay the course until the ninth hour. ❤️🙏 PS your mother is quite lovely, still! Thank you, Jane. It truly is a privilege to still have Mom with us! Now I know where your kindness and courage come from! A deep bow to both of you.